Hornady Superformance 223 Remington Ammo 53 Grain V-Max Point ammo for sale online at cheap discount prices with free shipping available on bulk 223 Remington ammunition only at our online store TargetSportsUSA.com. 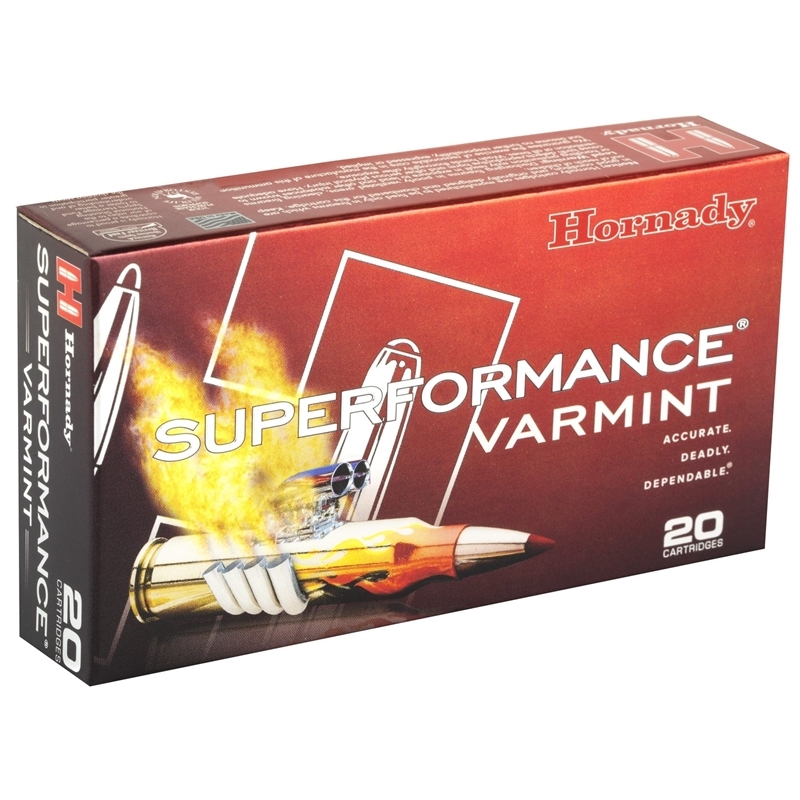 Target Sports USA carries the entire line of Hornady Superformance ammunition for sale online with free shipping on bulk ammo including this Hornady Superformance 223 Remington Ammo 53 Grain V-Max. Hornady Superformance 223 Remington Ammo 53 Grain V-Max review offers the following information; Topped with the finest bullets, Superformance Match ammunition carries the very best cartridge cases with extremely stable propellants that are custom blended for each individual load to provide true ammunition performance enhancement! This Hornady Superformance 223 Remington ammunition is loaded with a 55 Grain GMX bullet. Gilding metal doesn’t foul like “sticky” solid copper, and strategically located grooves in the bearing surface of the bullet reduce pressure. Superformance ammunition is 100 to 200 fps faster than any conventional ammunition on the market today, and achieves this performance in every gun, without increases in felt recoil, muzzle blast, temperature sensitivity, fouling or loss of accuracy. All Hornady Match bullets feature revolutionary AMP (Advanced Manufacturing Process) bullet jackets Developed by Hornady engineers, these bullet jackets are a technological advancement in design, tooling, and manufacturing that combine to produce the most consistently concentric bullet jackets available. Superformance ammunition is loaded with proprietary propellants that increase the velocity ratings up to 200 feet per second compared to other popular brands. Because there is no increase in pressure, regardless of the caliber, there is no increase in felt recoil but there is an increase in efficiency and high speed performance. This Hornady Superformance Match 223 Remington ammunition is perfect for shooting competitions such as Camp Perry and 3-Gun matches. Hornady Superformance Match is non-corrosive, new production ammunition in boxer primer and reloadable brass cases. Hornady 223 Remington ammo is packaged in boxes of 20 rounds or cases of 200 rounds. Purchase a case of Hornady Superformance Match 223 Remington bulk ammo from Target Sports USA and receive free shipping! Great performance. This stuff is super fast!! Little more pricey but I have one rifle that just loves it!! Excellent product and target sports has some of the best prices around. does a number on coyotes! !